The power liftgate operation can be turned on or off by the power liftgate main switch on the instrument panel. 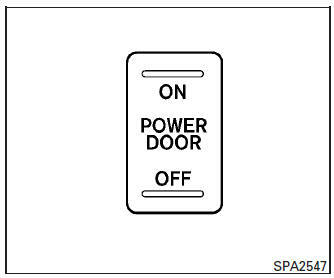 When the power liftgate main switch is pushed to the OFF position, the power operation is not available by the power liftgate switch on the liftgate close switch or liftgate open switch A or B . Power operation is available when in the OFF position by the instrument panel switch and the keyfob button.